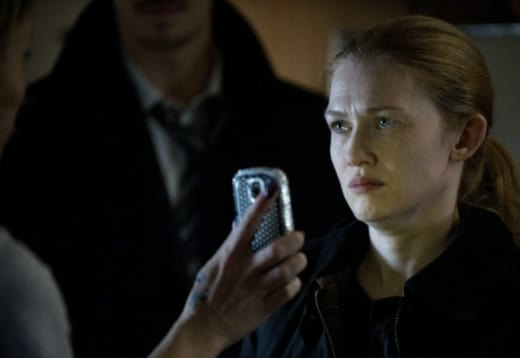 Bit by bit, inch by inch, raindrop by raindrop, The Killing Season 3 and its serial killer case continue to move forward in a positive - if not gripping - manner. In wonderful serialized fashion, the story progresses on all fronts, lets the surrounding characters grow with each situation and allows each episode to feel like simply the next step... rather than a bunch of moments leading up to a shocking ending of the hour. There's something about this refreshed and revamped version that can really pull a viewer in. Topping off the list of great moments had to be the reuniting of Linden and Holder as partners. Sort of. Unofficially. Don't get me wrong, I actually like Holder's new partner, Reddick. He brings a different personality to the table that's charismatic in its own right. But Linden and Holder are made for each other. Watching them interrogate Mama Dips for the whereabouts of her son, the cabbie, Joe; taking a smoke break together; entering the animal hospital guns drawn; even having a meal together... it all felt right. Linden is certainly on a war path to stop this killer and find Kallie, even if that means running her mouth a little more aggressively. It's a bit more than her usual quiet self, but it's good to see she's impassioned by the case. But really, when it comes down to it, Holder can't help but steal the show. How great was it when he went to the back of the car in his suit and tie only to reappear in his classic hoodie and jacket? Not to mention listening to his excitement for DVRing a show about catfish, his feeble attempt at trying to explain why he forgot Valentine's Day (celebrating on the 15th because it's less commercial isn't exactly going to cut it) or the general dialogue and demeanor of the character commands each scene. What's more, through his hard edge/no fear type of swagger, he carries a soft spot not only for Linden, but Bullet as well. It was a rather sincere moment when he held her at the end of the episode, especially after she had punched him. Bullet is growing on me, even if she remains abrasive and cocky. There's a resilience behind that character, despite all the insane odds thrown her way. And I'm glad she's useful in the sense that she has knowledge and informants that the police do not. This season is really doing a good job of making you care about characters you might not have thought you should. Kallie's mom makes you want to give her a worst mother award, but it was good to see her start to show some care and concern. Now, that newfound persistence just might get her killed with the discovery that Joe has Kallie's phone, unfortunately. Seward remains a delight to watch, mostly for the fact that you're simply waiting for him to do something crazy. Instead, we got to see some more moments from him that appeared more human than monster, even if he still is trying really hard to be the "villain" for everyone. Having him laugh at his son's foster mother was cruel and fitting of the sadistic character he's trying to be, but those comments about forgiveness really struck home. I really feel as if Seward's knowledge of his impending death make him try and shut everything else out. Listening to his prison buddy tell the tragic story of murdering his parents and then receiving forgiveness from his siblings was a great dramatic moment. Not only is the character more of a side note in the grand scheme, but his time was impactful not only on the concept of forgiveness but of Seward and his emotions. There's something that really starts hitting home with the character aspects beyond the case, as fascinating as it is. And I wasn't upset that the redhead teen we thought was Kallie was simply another girl fallen into the snares of this unknown killer. It was a freaky moment seeing the girl with the missing finger - neck stitched up from long cuts and a bruised face - go from silent to screaming. It was jarring and disturbing, and it makes you feel for the girl as well as want the killer discovered and brought to justice. "Scared and Running" was another strong episode for the season, nailing the suspense, tension, subtle character moments and compelling stories that seem connected even though we aren't quite sure how yet. 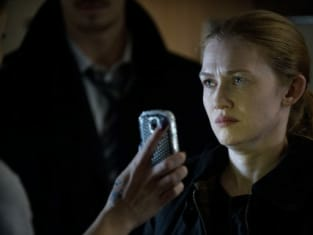 Clearly, Linden and Holder are back, and with each passing episode, it looks like AMC made the right decision to revive its moody and rain soaked show of murder, drama and intrigue. What did you think? Are you hooked on the show? Who is the killer? Sound off below!